This book surprised me. I expected it to be filled with lots of gossipy tidbits and it was. I wasn't expecting it to be so detailed, culminating in an easy to follow timeline of political events (but not all of them). Some of these events were well known due to the constant media saturation of all things Trump. Below is an abbreviated list of some of the events mentioned in the book, focusing on Russian election intervention. Other topics were left out by Wolff as it seems he only wants to highlight the more scandalous ones; after all, he has a book to sell. For the purposes of full disclosure, I am not a Trump supporter. I'm a true-blue liberal from the Northeast -- but this is Wolff's timeline, neutrally presented. During the first week of the Trump administration in January 2017, acting Attorney General Sally Yates notes that she has grave doubts about newly confirmed National Security advisor, Michael Flynn, and his connections to Russia. In week two she is promptly fired for this (and also for her refusal to enforce the new immigration order). This is also the first inkling of Russian trouble to come, but US authorities has had Russian contact on their radar leading up to the election. Flynn resigns in February due to pressure from this and lying about it to Vice President Pence. In early March 2017 there is a leaked story about how Jeff Sessions, the newly confirmed Attorney General, had denied in his confirmation hearing that he had ever met with the Russian ambassador, Sergey Kislyak. In fact he had met with him twice. Sessions recuses himself from the Russian investigation and Trump goes ballistic. Jared and Ivanka (now known as Jarvanka to the inner circle) were panicked that the FBI and DOJ were moving beyond Russian election interference and into finances. They urged Trump to fire James Comey, director of the FBI. He does so in May. This ultimately backfired on Trump as it led to Deputy Attorney General Rod Rosenstein appointing former FBI Director Robert Mueller as special counsel to lead the investigation into Russian meddling and related issues that Comey had supervised during his tenure. In July a meeting that took place thirteen months earlier on June 6, 2016 is leaked. Don Jr., Jared and Paul Manafort met with a cast of dubious Russian characters in the Trump Tower on that day. Per Wolff, "When this meeting became public thirteen months later, it would, for the Trump White House, encapsulate both the case against collusion with the Russians and the case for it. It was a case, or the lack of one, not of masterminds and subterfuge, but of senseless and benighted people so guileless and unconcerned that they enthusiastically colluded in plain sight." Steve Bannon, once the key advisor to Trump and purveyor of the "nationalist ideology", is fired by Trump in August. Bannon has been subpoenaed to testify to the Mueller commission based in part on what he is quoted as saying in this book about Russian complicity, but as of this writing in Feb. 2018, his testimony has not yet been made public. Wolff follows Trump for about a year in the book starting with election day. He seems determined to show Trump, warts and all, and does a pretty good job of just that. It must be noted here that it was heavily implied by Wolff that Trump did not expect to win or really want to win. He had big plans to market himself on a new conservative network (that never got launched) and make millions off of that. He already had a built in excuse for losing: "It was rigged." But a strange thing happened during the campaign, a perfect storm of Hillary haters, government haters, and people just fed up with the status quo -- they collided and decided to elect the person they thought would fix everything, because he wasn't "one of them." At the very onset of being elected Wolff says "There was, in the space of little more than an hour, in Steve Bannon's not unamused observation, a befuddled Trump morphing into a disbelieving Trump and then into a quite horrified Trump. But still to come was the final transformation: suddenly, Donald Trump became a man who believed that he deserved to be and was wholly capable of being the president of the United States." Right from the start what Wolff wants to make clear is that most people in Trump's inner circle did not have a high opinion of his intellect, including Steve Bannon, Roger Ailes, and Rupert Murdock but they would play with him to get their own agendas met. Dirty politics and the corporate world's ethical and moral lines, while never crystal clear, were now quite blurred. Trump started to slowly put his administration together but in very short order it would become very obvious that this administration was going to have a revolving door on recruitments. It is interesting to note here that in the first year of his presidency, Trump had a 34% rate of turnovers (fired or resigned). Compare that to Obama's 9%, Bush's 6%, and Clinton's 11%. You have to go back to Reagan to get the next highest to Trump's and that was 17%. Trump's style of huge rallies, tweets, spontaneous phone calls to radio and television shows, was also the very thing that started exposing many Trump claims that were not remotely true. This only fueled his already antagonistic relationship with the media ("fake news"). Wolff said "A minor journalism controversy broke out about whether these untruths should be called inaccuracies or lies." Trump was well-known for not reading, but he also didn't listen. He preferred to be the person talking. He also was well known for his short attention span. All this hampered communications and still does today. Wolff writes, "As [White House Deputy Chief of Staff for Implementation Katie] Walsh saw it, Steve Bannon was running the Steve Bannon White House, Jared Kushner was running the Michael Bloomberg White House, and Reince Priebus was running the Paul Ryan White House. It was a 1970s video game, the white ball pinging back and forth in the black triangle." (pg. 117). Wolff saw all three learning how to best appeal to Trump in their own way. "Bannon offered a rousing fxxx-you show of force; Priebus offered flattery from the congressional leadership; Kushner offered the approval of blue-chip businessmen." (pg. 120). Trump wanted all three options and didn't understand why they didn't mesh with each other. All three players learned how to use the media to get their messages out there -- they became polished leakers. What is evident at this point is that all key players in the Trump White House would do whatever it took to get an advantage for their side -- if that meant lying, so be it. For one example of many, in April 2017, Gary Cohn, Director of the National Economic Council and chief economic advisor to Trump, via an email of his, got caught remarking "I am in a constant state of shock and horror", referring to the inner workings of the Trump White House. Wolff points out the manipulation going on post the infamous Russian meeting, getting leaked to the press. "The fortunes of Don Jr., Paul Manafort, and Jared Kushner hung individually in the balance. Indeed, the best guess by many in the West Wing was that the details of the meeting had been leaked by the Kushner side, thus sacrificing Don Jr. in an attempt to deflect responsibility away from themselves." There followed, per Wolff, a stream of constant denials by the Trump White House that no discussion between campaign officials and Russians connected to the Kremlin took place. Also, that most people in the know did not believe that Trump knew nothing about it. The blame game continued. Wolff writes, "Meanwhile, the couple blamed everyone else in the White House. They blamed Priebus for the disarray that had produced a warlike atmosphere that propelled constant and damaging leaks, they blamed Bannon for leaking, and they blamed Spicer for poorly defending their virtue and interests." Wolff sums up where Trump's presidency stood before the end of his first year. "What now existed, even before the end of the president's first year, was an effective power vacuum. The president, in his failure to move beyond daily chaos, had hardly seized the day. But, as sure as politics, someone would." "In that sense, the Trumpian and Republican future was already moving beyond this White House. There was Bannon, working from the outside and trying to take over the Trump movement. There was the Republican leadership in Congress, trying to stymie Trumpism -- if not slay it. There was John McCain, doing his best to embarrass it. There was the special counsel's office pursuing the president and many of those around him." After reading this book I can't say it moved my Trump opinion meter much, if at all. I still find him inept and totally unqualified to be our president. I don't believe this book will affect his fans, though. They either won't read it or will read it and will regard it as pure rubbish and lies. It's worth pointing out here that the author, Michael Wolff, puts into print a lot of embarrassing facts about key players. No one has sued him for this (yet). Trump has threatened (he has a long history of threatening libel suits but rarely does) but to date has not gone forward with it. To me Trump seems more like a man obsessed with his public image than a man interested in leading his country. He is vulnerable to whoever is complimenting him at the moment. He loves nothing better then inflating his own ego. He has proven to have a vengeful spirit and does not listen to good counsel, convinced he is the best source of information on everything. He does seem to be running scared of the Mueller investigation, but you can come to your own conclusions on that after Mueller's results are published. The book is biased against Trump, but I honestly feel there are truths and facts in this book that should not be overlooked, some of which I have already put in this review. No one is going to change Trump now -- he is what he is. We can change our future though. I hope people will get tired of the daily show and want more. If you honestly feel he is fighting for you, cares about you and has helped you, then you are his base and you won't change. But for many others, this is not the case, and I do believe 2020 will reflect that. This time I am predicting we will not get an "accidental president". Donald Trump: OpEd: Next drama always changed conversation: except Russia. Donald Trump: Why can't Medicare simply cover everybody? Donald Trump: OpEd: early signs by 2008 of immigration resentment. 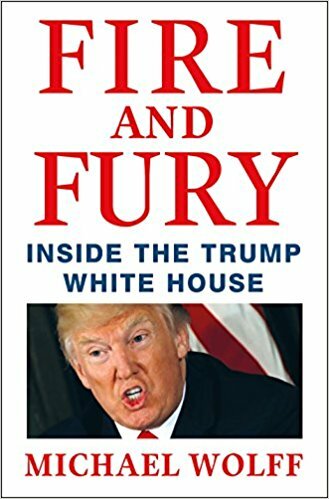 Donald Trump: FactCheck: "Fire and Fury" ignored Trump's 2000 book. Donald Trump: OpEd: Replaces art of the compromise but the art of conflict. Donald Trump: OpEd: input on options from multiple advisers.